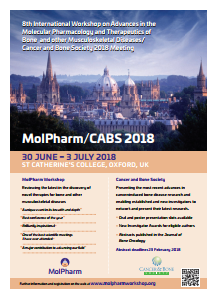 MolPharm/CABS 2018 About the meeting - MolPharm About the meeting - CABS Programme CABS New Investigator Awards Presenter instructions Registration Information for delegates Exhibition and sponsorship Venue Accommodation Travel Other information Contact Bisphosphonates 2019: celebrating 50 years! Thank you to everyone who came and participated in the 2018 MolPharm-CABS joint meeting. We hope you enjoyed it as much as we did! The abstracts have been published in the Journal of Bone Oncology, Volume 13, November 2018, pages 11-54. Please follow this link to view the abstracts. You may also be interested in the Bisphosphonates Anniversity meeting we're organising in Sheffield in July 2019 - details here. Details of future Cancer and Bone Society meetings will be announced through the CABS website. Reviewing the latest in the discovery of novel therapies for bone and other musculoskeletal diseases. The 2018 MolPharm Workshop is the 8th in a series that started in 2003. It is intended to provide a basis for understanding the molecular mechanisms of action of drugs known to act on the skeleton, and a rational basis for developing novel therapies in the future, based on some of the remarkable recent advances in the genetics and biology of bone and the musculoskeletal system. The Workshop is interactive and international, with speakers who are leaders of their fields in academia and industry. The workshop is held at St Catherine’s College, Oxford. This delightful campus setting creates excellent opportunities for productive interactions among all participants. For those who’ve attended before, you’ll know this means an exceptional meeting which combines cutting edge exciting science with a friendly and supportive atmosphere, and which encourages discussion and collaboration both in and out of the lecture theatre. Interaction between senior international scientists, clinicians and more junior researchers is particularly encouraged. If you are interested in knowing more about previous workshops please see our History page – the programmes provide an interesting pointer to some of the most significant developments in the field since 2003. The primary mission of CABS is to formally run the cancer-induced bone disease (CIBD) meetings, initiated in 1991, and to promote international collaborations across the cancer and bone field in both clinical and basic research. Where appropriate CABS will partner with other societies that have an interest in bone and cancer. CABS believes these partnerships will enhance research and education in this rapidly developing area of biology and promote the translation of increasing scientific knowledge into clinical practice. Our proposed Cancer and Bone scientific programme will present the most recent cutting edge advances in cancer-induced bone disease research and will provide an important opportunity for established and young investigators to network and present their newest research. For further information about CABS please see the Cancer and Bone Society website. Please click on the links below to view the programme, posters and invited speaker profiles. The abstracts will be published in the Journal of Bone Oncology shortly. Citation details will be posted here when known. The following awards were made by the CABS committee based on scores achieved during the abstract review process. Congratulations to all award winners! OC12: The small molecule adiponectin receptor agonist AdipoRON exhibits anti-myeloma activity in vitro and in vivo. Registration is now closed - thank you everyone for coming and hope you had a great time! This is a residential meeting, and we recommend that delegates stay on campus in order to get the most out of their attendance and to take full advantage of the networking opportunities, but of course day delegates are also welcome. St Catherine’s is a compact campus close to the city centre. All bedrooms include private bathrooms and are a few metres walk from the lecture theatres and dining hall. Meeting fees are charged by the day, with the rate for each extra day reducing as you opt for more. There is a 15% reduction on meeting fees for CABS members and students/allied health professionals. Exhibition and sponsorship opportunities are available. For more information please contact Janet Crompton. Registration is in the Porters’ Lodge. Lectures are in the Bernard Sunley Lecture Theatre. Oxford established itself as a centre of academic excellence in the thirteenth century, with the founding of its first three colleges and academic Halls. The University is the oldest in the UK, and forms the heart of a fascinating city. As well as a priceless heritage, modern Oxford offers a wide range of entertainments and shopping options, and within a short distance lie the Cotswolds, Stratford-on-Avon, home of William Shakespeare, and Blenheim Palace, birthplace of Sir Winston Churchill. All scientific sessions will be held at St Catherine’s College, Manor Road, Oxford, UK. St Catherine’s College founded in 1962, is one of Oxford’s newer colleges. Designed by Danish architect Arne Jacobsen, the College has a traditional layout in quadrangle style with gardens. Its situation and architecture make it a most successful conference venue. For those who would like to know more the history and architecture of St Catherine's College you can read more here and here. And for an interesting insight into the life of an Oxford Don, John Simopoulos, founding Fellow, Tutor in Philosophy and Dean of Degrees, you need look no further than this obituary. He was such a character that the college still holds an annual dinner in his honour! For those who book accommodation, you will be staying at St Catherine’s College. Please collect your room key from the Porters’ Lodge from 14:00 on the day of arrival. Most of the rooms are for single occupancy. A small number of twin rooms are available but are likely to be booked quickly. Please enquire before registering if you wish to book a twin room. For those staying at the College, please note that rooms must be vacated and keys returned to the Porters by 10:00 on the day of your departure. Luggage can be stored in the Porters’ Lodge. Detailed travel information and maps can also be seen on the St Catherine’s College website. There are several major airports within 90 minutes of Oxford: London Heathrow, London Gatwick, Birmingham and Luton. Regular coaches and trains connect the airports with the city. If you have a choice, we recommend that you fly to London Heathrow or Birmingham. Please see The Oxford Bus Company: The Airline for further details. Pick up the bus at the Central Bus Station Bay 14A for terminals 1, 2 or 3, or Terminal 5 Bay 11. From Terminal 4 you can either go to the Central Bus Station or to Terminal 5 Bay 11. Take the bus to Gloucester Green Bus Station in Oxford and a taxi from there to St Catherine’s College. Alternatively, get off in High Street (by Queen's College) and St Catherine’s is a short walk (15 minutes maximum). Fare – £23 one way, £30 return. Please see The Oxford Bus Company: The Airline for further details. Pick up the bus at the South Terminal Upper Forecourt or North Terminal Bay 4. Take the bus to Gloucester Green Bus Station in Oxford and a taxi from there to St Catherine’s College. Alternatively, get off in High Street and St Catherine’s is a short walk (15 minutes maximum). Fare – £28 one way, £37 return. There is a direct train service from Birmingham Airport to Oxford. The journey takes just under an hour. The Oxford Carriage Company offers airport transfers. Please see their website for prices and to book. Pick up/drop off is St Catherine's College Porters' Lodge. For information about how to get to St Catherine’s College by rail, coach, car, or on foot, and a map please visit the college website. If travelling by train, please note that there may be some disruption to services into Oxford Station during the time of the meeting and you are advised to double-check the best options for your journey. You can find more information about the disrupted services here. Those travelling from/to London may be best to use London Marylebone station and to travel to Oxford Parkway station, rather than the Paddington to Oxford Station route. If travelling to Oxford by car please use the Park and Ride where possible. You can find information about Oxford Park and Ride sites here. It is strongly recommended that you use public transport for your journey. Some parking is available in the College car park but cannot be guaranteed or pre-booked. If you do need to bring your car please leave a note on your dashboard with your name and mobile number, and a note that you are attending MolPharm/CABS 2018. Disabled access is available. It would be helpful if you could let Janet Crompton know in advance if you may require any special assistance during your stay in Oxford. In the event that the meeting is cancelled, or it if cannot take place for any reason outside the control of the organisers, the amount of the conference fee shall be refunded. The liability of the organisers will be limited to the refund and they will not be liable for any other losses incurred. In addition, the organisers shall not be held liable for any personal accidents, illness, losses or damage to private property of delegates registered for the conference. Delegates are therefore advised to take out their own comprehensive insurance. The official language of the meeting will be English. The meeting finances are handled by the Paget’s Association, UK registered charity number 266071. Bisphosphonates 2019: celebrating 50 years! 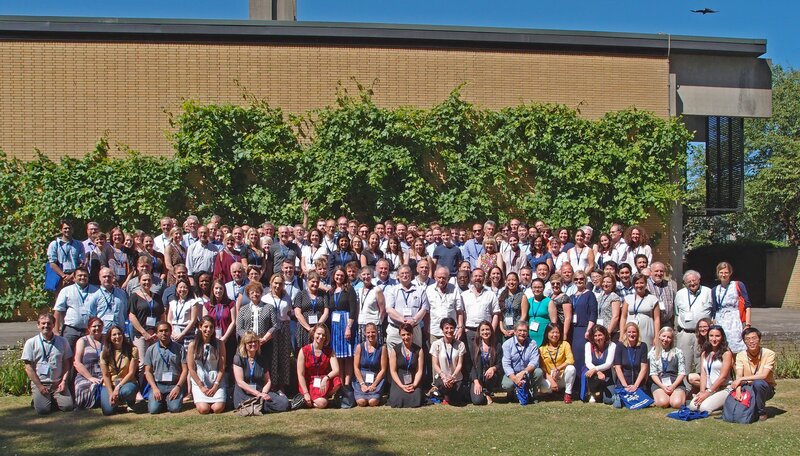 We are delighted to announce that in summer 2019 we'll be organising a one-off meeting to celebrate 50 years since the first publication describing the biological effects of the bisphosphonates. The dates are 15-17 July 2019 and the meeting will take place in Sheffield, UK. For more information and/or to sign up to the mailing list please visit the Bisphosphonates 2019 website. Download to share on departmental poster boards, social media etc.